Thomas J. Miller’s past, or at least the mystery of where he came from and what he had done, kept creeping back into his life. 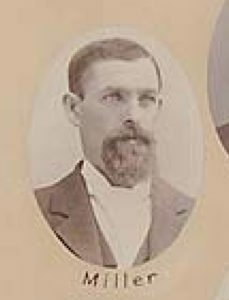 Miller was a progressive politician in Thurston County at the turn of the 20th century who at different points served in the state Senate and as mayor of Tumwater. Ironically, his biggest political gaffe by today’s standards happened in metaphorical broad daylight and with witnesses. And Miller never tried to claim he said otherwise. One evening in 1896 while campaigning for state senate out near Mud Bay, Miller pointed out that “Jeff Davis was not such a bad fellow after all.” Jeff Davis—as in Jefferson Davis—was the president of the former Confederacy. Even though the Mud Bay residents who heard Miller were reported as “indignant,” Miller ended up winning his race that fall. But that wasn’t the case a few years earlier when Miller was running for the same seat. 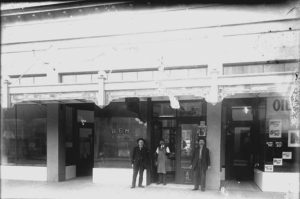 He had only arrived in Thurston County a few years before in 1891 when he first started making a mark for himself in politics. Newly married, he quickly opened a cigar factory in Olympia and became involved in informal populist organizations. He unsuccessfully ran for office in 1893 as a member of the People’s Party. That year turned out to be a big year for Republicans, with more than 75 serving in either chamber of the legislature, with only nine members of Miller’s party. It was rumors of Miller’s past that haunted him in that 1893 race. It was said throughout the community that Miller had taken part and helped organize labor riots in the 1870s and 1880s before he moved west. Despite providing a signed affidavit that he had not in fact been a labor radical, the allegations followed him to election day and Miller came up short. Despite praising the Confederate executive in a state that as a territory had supported the union (and whose usual Republican politics made it unfriendly to Southern sympathies), the 1896 economic depression pushed politics towards Miller and his now Populist Party. Joined by Democrats and splinter Republicans in a fusion ballot statewide, the Populist Party won 50 seats in the two chambers of the legislature and the governor’s mansion. For Miller though, his time in the progressive wing of the legislature was marked by a political division with the populist governor, John Rogers. By 1899, Miller and Rogers had split on the formation of a commission to build a permanent Capitol in Olympia. While the legislature had passed a bill to form the commission, Rogers had vetoed it on the basis that it was unconstitutional. Miller, in a floor speech during the debate over whether to override the veto, laid out his anger with the governor, going as far to say that the Puyallup drug store owner governor was part of a conspiracy to move the capital to Tacoma. During the election the next year, Miller not only refused to stump for his party’s candidate for governor (Rogers), citing care for his cows taking priority, but he also voted sarcastically for Rogers in the U.S. Senate race. At that time, state legislatures chose the state’s senators instead of the voters, and Miller supported Governor Rogers for the job to get him out of the state. “…(H)e would at least be placed in a position where be would be harmless,” said Miller. It was just about a year later when the mayor’s past (or someone’s past for that matter) came back to haunt him. Miller had been married to two women at the same time for 15 years and in 1905 he filed for divorce from his first wife. Apparently, masquerading under the name Charles Howard in Illinois in the early 1880s, Miller had married Mary (Moore) Howard (later Leafgreen). The relationship didn’t last long, and before abandoning her, Miller came clean with his real name and left town. Eventually, Miller made his way to the West Coast and married Martha Stewart Miller in 1890. In the meantime, Mary (Howard) Leafgreen learned that the decendents of a Charles Howard were due an inheritance from a wealthy St. Louis family. Her claim that her marriage to Miller who was using a fake name put her in line for some money, brought Miller’s past into the light. The woman at the center of the debate in Illinois denied that Tumwater’s Miller was the Howard that she had married, saying that her Howard was dead (thereby granting her an inheritance). That debate boiled on while the Howard family tried to prove that Miller was her Howard. And, for him personally, Miller began to suffer. Within days of the case making the news, Martha Miller quickly found a reason to be out of town, finding friendly faces in British Columbia while visiting acquittances as her husband cleared up his bigamy. A week later, Miller suffered a heart attack at work. Miller would say it didn’t have anything to do with the bigamy, divorce, or inheritance case, but that he should quit smoking. Mysterious midwestern agents would also come into town to hassle him. One such agent refused to answer pointed questions from authorities about what he was doing in Olympia and was heard arguing with Miller at his cigar factory. Two months after filing for divorce, Miller was finally granted a dissolution by the local authorities. The Howard family would end up standing firm, saying that Miller was not their Howard (obviously) but their lawyers were able to track down Illinois residents that clearly remember Miller living in the midwest in the 1880s as Charles Howard. 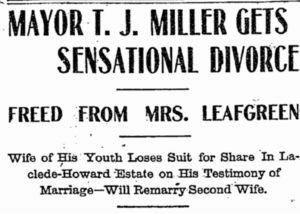 After the tantalizing divorce trial, Miller began to fade from public memory. He would sell his cigar factory soon after the divorce became final. He and his family moved out of Tumwater to a farm in 1908, ending his tenure as Tumwater mayor. He restarted his cigar business in 1913, but that was the last real note of his life available. Miller died in 1921.